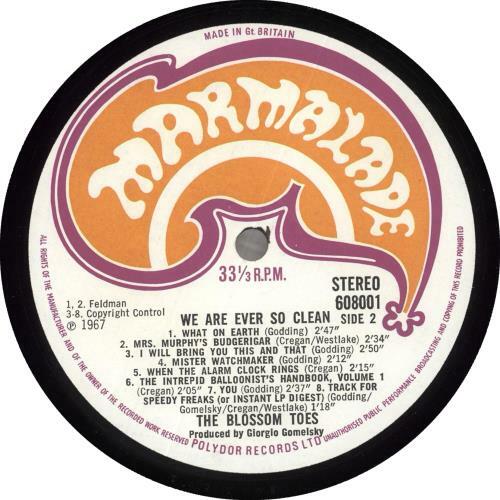 BLOSSOM TOES We Are Ever So Clean (Rare original 1967 UK rough textured Marmalade label 15-track stereo LP, released at the height of 'flower power' in 1967 and widely considered to be the finest pop-psych album ever recorded, a fascinating amalgamof whimsical pop, music hall humour & acid rock; fully laminated picture sleeve. See 'more info' for details...). The fully laminated picture sleeve displays only a little light wear, with some light creases to the laminate and a small amount a scuffing to the corners. The labels remain clean, free from any writing and has only a couple of light marks around the spindle hole. The vinyl remains very clean with just a few very light surface scuffs. We have professionally cleaned & play tested, and can confirm this example sounds fantastic. 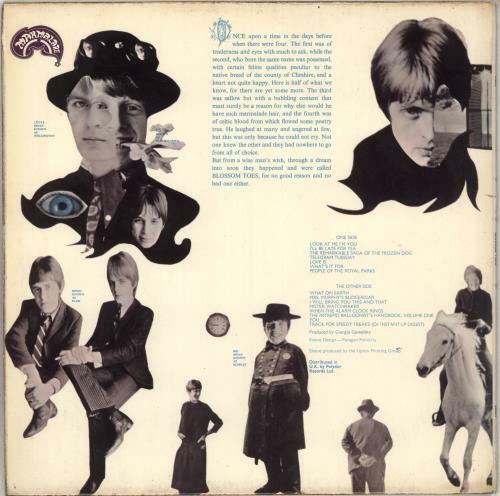 An outstanding example of this rare pressing. or visit our Blossom Toes image gallery.